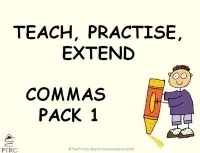 This Teach, Practise, Extend PowerPoint resource focuses on clauses. Slide 2 (practise) - Children are asked to read sentences and underline the main clause in blue pencil and the subordinate clause in red. Slide 3 (extend) - Children are asked to join two clauses with a conjunction. There are 5 to complete in total.